I just finished the Christmas blocks in the 8×8 size. It was well worth the effort, because they are stunning. I used Mylar behind some of the motifs (Christmas trees and wreaths, and the angel’s wings) and it added a beautiful sheen to the designs. This quilt will become a family heirloom! 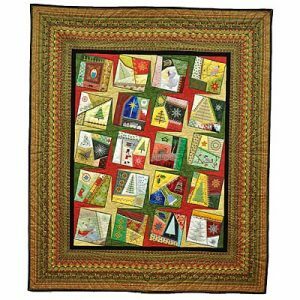 Linda, my Christmas Crazy Quilt is half completed but I cannot wait until it is finished to thank you for your extraordinary work. Sewing it is an absolute joy. I appreciate the level of detail and novelty in each block. Your work is truly wonderful. I too just completed an 8×8 block. To test the first block, I did it with gold thread on white background. Although done with only one color, there is such wonderful detail that I may do more blocks with only one color. Everything fits and sews perfectly! I then did another block with appliqued fabrics. I love them both! I have become addicted to your crazy quilt blocks. Each day I have to have my required dosage of two blocks completed to survive. I love the details, creativity and beauty of the blocks. 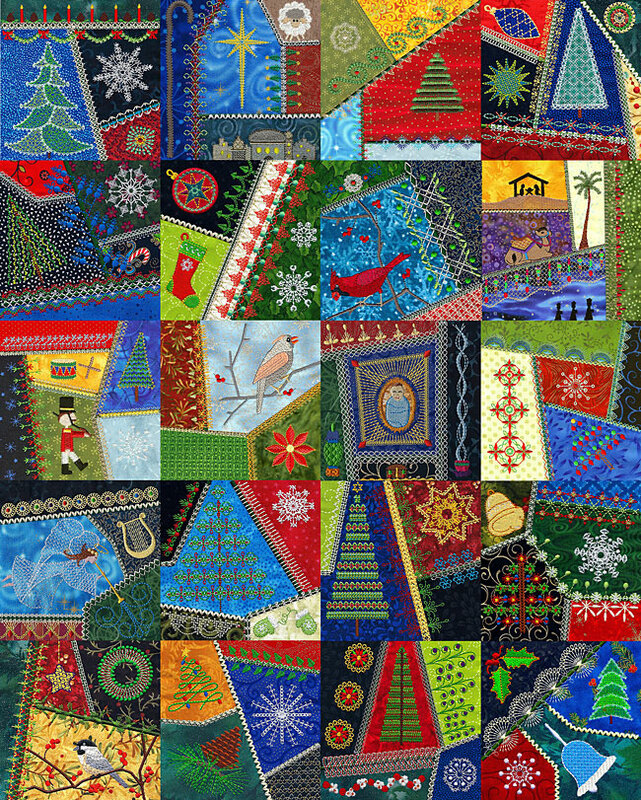 I have just completed the Christmas Crazy collection; I sewed the 8×8 inch quilt edge designs. I want to let you know how delighted I am with the designs! In the entire collection of 20 blocks, I had two thread breaks–due to what were, two tired needles. The designs embroidered so beautifully, the registration was perfect. The thought and technique you put into your digitizing is amazing. 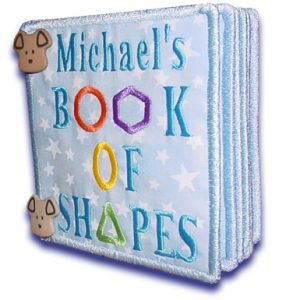 I loved the 1/4 inch setback, and the attention you even gave to the eyes on the images, so that one doesn’t have to clip a tiny jump stitch over a fill pattern. I took the completed designs to my embroidery club… did a little advertising on your behalf! I just recently discovered your crazy quilt series and am working on myfirst quilt. Thank you for all the hard work you have put into these wonderful designs for the quilts. I haven’t had this much fun since I first discovered chocolate! 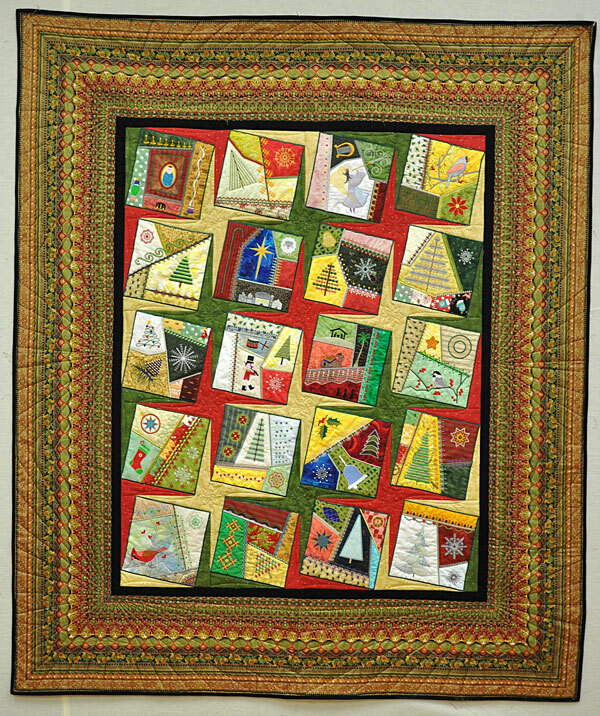 Hi Linda- I finished my Christmas Crazy Quilt last week and it looks magnificent. I put a simple black sashng between the blocks and a black binding. It is so striking. It will be an heirloom for my grandchildren. I agree about the beauty of the designs. I especially love the different stitches on hte overlaps. 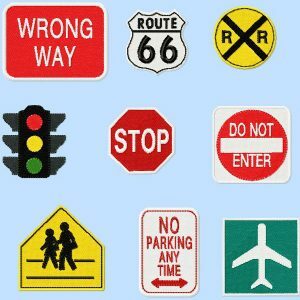 IThe choices awre just terrific. How fun it is to stitch these out!! Thank you for your hard work and your creative mind. It makes us look good! 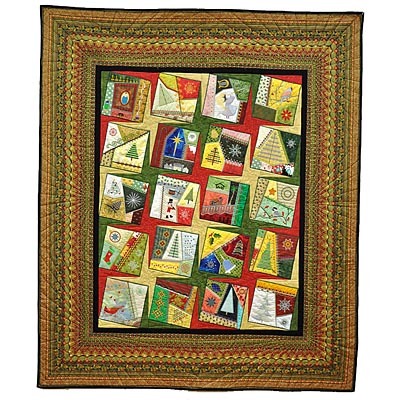 I purchased the first 3 parts of the Christmas Quilt series 2. These stitch out beautifully. I am hooked. My husband was ready to go out to dinner and I said please just let me finish this one part. I ended up finishing the entire square. Once you start, you just can’t stop. These blocks are very addictive. Keep up the wonderful work. I can’t wait until part 4 comes out. I’m ready to purchase it to add to my quilt. I debated about purchasing another embroidery pattern. I really didn’t need another, but I did it anyway and am super happy I did. As with the other patterns, the digitizing is top notch and everything stitches out perfectly. Very dependable and certainly worth more than the price. I’ve done several blocks and found a method I am extremely happy with. I hoop the least expensive muslin I can find along with a light weight tear away from JoAnn’s. (Got it on sale at 50% off). The pattern does not distort and lays flat when finished. I can add the batting and backing when I finish the quilt. All I can say is Oh My Goodness. 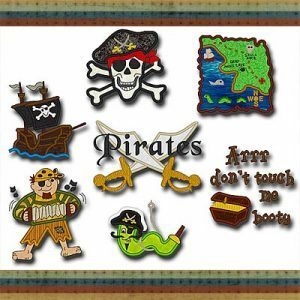 Your Crazy Quilt Designs are incredible. I am having such a fun time with the designs…it is like watching artwork form before my very eyes. Thank you for your vision and for the detail that you have included in each of the designs. What a gift you have been blessed with. Thanks for your willingness to share it with us.